At WesBurger, Wes deep-fries his tater tots. If you have the ability to deep-fry the tots he highly recommend it for maximum crispness. An oven will work fine, as well. Wes prefers using Ore-Ida tots but, any frozen tater tot will work. If frying: Deep fry 10oz tots at 350 degrees Fahrenheit for 2:30-3 min. If baking: Bake in oven following instructions on package. Allow tots to rest 30 seconds over fryer or on a paper towel to remove extra oil. Mince 6 cloves of garlic, 1 tablespoon parsley, and mix with 100ml PdH olive oil. 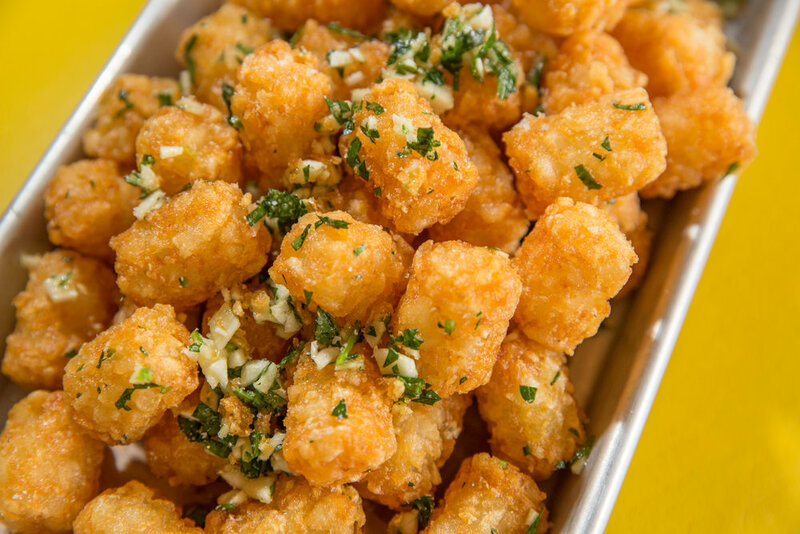 Place tots in large bowl and toss with salt, then add oil, garlic, and parsley mixture while tossing tots. Serve in a bowl. Before serving, spatula all remaining garlic, parsley, and oil from bowl on top of tots.